Lt. Gen. Bill Harrison (ret), receiving his plaque from Board Member Kris Kauffman. Trooper Horne and Sergeant Howzer in authentic uniforms. Lakewood Historical Society hosted a double-header program this past Tuesday night at St. Mary’s Episcopal Church in Lakewood. More than 85 attended the Nov. 19 program. Lt. Gen. Bill Harrison (USA ret. ), who has retired from the board after five years of service, was honored with the naming of the Society’s Leadership Award. He was further recognized and “promoted” to director emeritus status in recognition of his years of service to the Lakewood community and the Society. 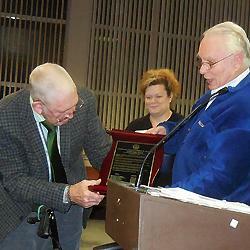 LHS’s treasurer Gary Fowler was honored to receive the award. 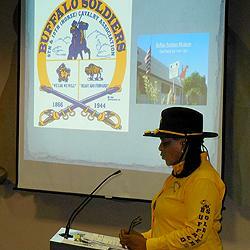 The Buffalo Soldiers Museum is located on 1940 Wilkinson St. in Tacoma (above the Atlas Foundry). Jones-Hook said that it is open from 11 a.m. to 3 p.m., Wednesdays and Saturdays. 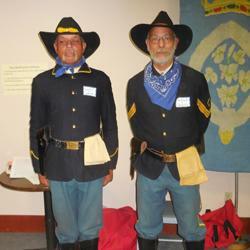 Visit the Buffalo Soldiers Website or phone 253-272-4257 for further details.